Lizards are opportunistic. Gardens, ponds and streams allow populations to prosper. Sprinkler systems will deliver enough water to keep any lizard happy and this leads to many taking up residence along outside foundation walls. Most species of lizards in North America are harmless and eat small insects. Vegetation such as shrubs and flowers are excellent nesting areas for many types. These same plants can become a target for lizards that will find them to be a great source of water during dry spells or in arid regions when water is sparse. Here is a short clip of the common Chameleon found in many regions of the world. Here is another Chameleon but this one turns brown. Controlling lizards is easy. First you should take away their food by doing a little pest control around the house. Next you should set out some repellent granules or repellent spray and lastly, consider setting out lizard traps if they’re inside the home. The first thing you can do is to reduce lizard food. In fact a good insect supply is the main reason they’re choosing your home for a nest site. To reduce lizard food, treat the foundation and landscape around your buildings. The best product for this is CYPERMETHRIN. It will provide a quick knockdown and control most any insect. In many cases, spraying every 1-2 months around your home will force nuisance lizards to leave. Be sue to spray at the rate of 1 oz per gallon of water. Coat the foundation, around windows, rain gutters, behind down spouts, around air conditioning units, where pipes enter and exit the home, in flower beds and more. Cypermethrin can be safely applied to turf, plants and structures. 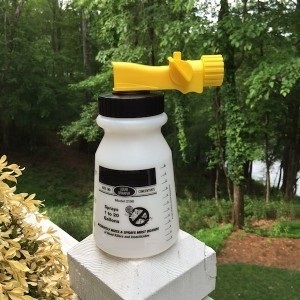 Use a good PUMP SPRAYER for treating the home; if you have a lot of yard to treat, a HOSE END SPRAYER will better suited..
For inside the home, control insects with DFORCE AEROSOL. 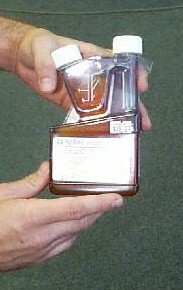 It comes with a crack and crevice tip for getting deep into voids where insects and lizards hide. The treatment will kill unwanted insects which serve as lizard food. The treatment will also irritate lizards so they won’t want to stay in treated areas. Next apply lizard repellents. The best lizard repellent is made from an all natural, low impact blend of food grade actives. It comes in both granules and spray. Lizards will detect its presence and stay away from where it’s applied. First, apply PEST RID GRANULES. around the homes foundation, walkways, patios, decks and other areas where lizards are seen foraging, roosting or nesting. The granules are not strong enough by themselves to do the job but they’re designed to both absorb and keep the liquid Pest Rid active longer. Typically they’ll extend the treatment a good 50-100% so you don’t have to spray but once every 30-45 days. Coverate is 250 sq/ft per pound so the 2 LB jar will treat up to 500 sq/ft. Next spray over the top with PEST RID SPRAY. Once impregnated with the liquid spray, the granules will keep the treatment secure and better abled to withstand rain, sun and other environmental variables. Be sure to spray the sides of the home including but not limited to gutters, downspouts, window shutters, electric boxes and areas where lizards like to hide. When used with the granules, Pest Rid spray treatments will last at least a few weeks and once the lizards are gone, treatments will remain effective for up to two months. 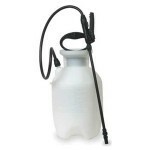 The quart size comes with it’s own trigger sprayer top; the gallon size will require a good pump sprayer to apply. Lastly, set out some baited LIZARD GLUE TRAPS. These are made for use inside the home and can be placed along baseboards, under furniture, on countertops or anywhere lizards are foraging. These traps are very effective at catching and holding common nuisance lizards. They include a wide range of insect pheromones in the form of small pellets which are simply dropped onto the glue trap prior to setting the traps out. Undetectable by people but quickly found by foraging lizards, these boards can be used to trap out local populations. If you have large lizards or need to trap outside where the traps will be subject to the rain and sun, get the OUTSIDE GLUE TRAP. These traps are commonly used for snakes and small animals but work great on lizards up to 1.5 feet long. They’re rain proof and can be used in the garden, flower beds, around the homes foundation as well as inside the home in crawl spaces or attics. They are quite sturdy and will last many years. Will this get rid of water dragons? I am so over them pooing all over my verandahs and they are very messy. Is there anything else u can suggest please? Thank you. Nothing else is needed. Apply the Pest Rid Granules and Pest Rid spray to where they’re active and you’ll chase them off within a few days. Reapply as needed to keep them away for good. Pest Rid works great for water dragons. I have lots of problem with lizards in my apartment. I live in INDIA. 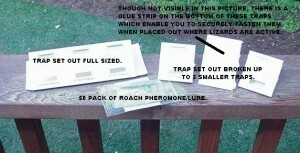 Will you be able to ship few packs of LIZARD GLUE TRAPS? And how much would the shipping be? Is the Pest Rid spray safe to use inside my house to repel lizards? Absolutely. Pest Rid can be used anywhere. And as you can read on it’s product page, Pest Rid will not hurt or kill anything since it’s made from all natural ingredients considered to have “low to no” impact on the local environment. It’s just so happens that these very same actives are also repellent to many pests including lizards too but that’s all it will do: repel them. Now I also feel it’s important to emphasize that the outside should be treated because in the end, these lizards are no doubt coming from outside and if you treat the perimeter of the structure with both the granules and the spray, in most cases you’ll be able to chase them off and out of your home without having to spray inside at all. This is usually the best way to handle lizard problems and though spraying inside can work, in the end the outside applications will usually have the biggest positive impact. What products do I buy to kill lizards? I have lots of them out side my house. I have rocks and dirt only. No grass. There is nothing that will kill them but we do have the lizard repellent granules and spray. Basically you want the Pest Rid Granules which you’ll apply to the ground where you don’t want the lizards active. Next, you’ll spray over the top with the Pest Rid Spray. Do the treatment every month to insure they don’t come back. And for the first month or two, if you see them return sooner than one month, treat as needed. Are Pest Rid Granules or sprays safe to use around children and pet dogs? Absolutely. Pest Rid is made from all natural ingredients and because these ingredients are used, they fall into a group of products which the federal government feels are so safe to use they don’t have to get any kind of special label or undergo the rigorous safety testing most all sprays must endure. Additionally, Pest Rid is just a repellent and won’t hurt anything. That means even if your pet did ingest some, there would be no impact because the product is made with essential plant and food oils which can’t hurt mammals. This characteristic makes it ideally suited for use in sensitive areas or where pets and children might be active. My husband and I have a serious infestation of some type of ugly lizards. They are see through (you can see their organs) and they have black eyes. Some of them are brown but all of their tails are spotted and some of them even have little horns on the back of their heads. UGH!!! We cannot get rid of them! Yes we live on the water and we have a sprinkler system, but we have sprayed insect repellant and DEMON trying to kill their food source to no avail!! NOW…….they are getting in the house every where! I cannot handle this as I am deathly afraid of them! PLEASE HELP! Set out some of the Lizard Traps inside the home to collect any that forage inside. Outside the home, apply Pest Rid Granules all the way around the home. Next, spray the foundation and ground over the granules with Pest Rid Spray. Treat every 2 weeks till they’re gone. You should be able to force them off the property with the Pest Rid as long as you apply it to every place you see them active as they’ll avoid the treatment. More information on these products can be read in our article above. In my house there are so many lizards. How do I control them? Please tell me what pesticides or products or sprays I need to get. If you review the article above, you’ll learn all you need to know about what to get and how to use it. Here is a brief summary. For inside, set out some Lizard traps. Also spray some Dforce in any cracks or crevices where they might be living or hiding. Next, set out some Pest Rid Granules around the outside of the home. Lastly, spray the exterior foundation of the home with Pest Rid Spray. I am the owner of a two story motel that has offices, rooms, laundry store and garden areas. Sometimes I see small baby lizard in any of the garden, laundry and storages areas. Can you please let me know how to stop them from developing and coming into other areas? Your help by guiding the follow-up preventive action plans in place will be highly useful to maintain my all areas and keep them neat and clean. Thanks. I’m sure we can help you manage this activity before it gets worse. For starters, I suggest you review our article above. As you’ll learn, taking away the lizards food supply is key to keeping them off and away from any structure. So with that being understood, you should make sure the structure is being sprayed on the outside exterior since this is where insects and then lizards will first appear. This should be done monthly with something like the Cypermethrin listed above. By keeping them off the exterior of the building you’ll be preventing them from getting inside which ultimately is the goal. Next, if you have mulch areas, flower beds or “gardens” like you mention in your comment, then they too should be treated with the Cypermethrin. It’s plant safe and will control various insects on which lizards like to feed. Next, applying Pest Rid Granules around the structure should be done. These should be used on the ground, in flower beds, mulch areas, etc. and replaced monthly. Now inside the structure you should set out some Lizard Traps to help monitor the local activity. These can be discretely placed in areas where patrons won’t see them but where you’ll be able to watch them daily to see if they’re catching anything. Typically what we find once these are installed is that lizards will start showing up in areas previously not thought to have a problem. And once these areas are located you’ll then be able to focus treatments on them to get rid of the source or common nest site. If you need further help on how to best proceed, give us a call toll free at 1-800-877-7290 and I’m sure we’ll be able to clarify any part of the process so you can manage this problem and keep the lizards away. Please show your support for our business by purchasing the items we recommend from the links provided. Remember, this is the only way we can stay around and keep this valuable web site up and running. Thanks for your business! I have always seen the small lizards running around and up the sides of the houses. They’ve never bothered me. Recently I have seen large Skink lizards with no tail. Scary. Thanks for the information. I will surly try your suggestions. I forgot to ask if this also gets rid of ants. I have a major problem. If you review our Ant Control article, you’ll learn that treating outside with Cypermethrin is one of the main things you’ll need to do to keep them out of the home. And if you follow this suggestion, the lizards will no doubt mostly leave. This is because lizards routinely nest around homes which have a lot of insects so by reducing their food, they’ll be forced to move elsewhere. And the Cypermethrin will readily kill and control ants, roaches and many other pests lizards love. Take away these insects and the lizards will have to relocate. I HAVE THIS UNGODLY PROBLEM WITH THESE VERY UGLY TRANSLUCENT LIZARDS THAT LIVE ON THE BRICK OUTSIDE MY HOME. I WAS JUST OUTSIDE WATERING MY FLOWERING PLANTS IN POTS AND SAW TWO (2) RUN OUT FROM THEM. THEY ARE SOOOOO UGLY LOOKING I CANNOT STAND THEM. WE NEVER HAVE HAD A PROBLEM WITH THESE UNTIL ABOUT TWO YEARS AGO. I STARTED NOTICING MY BEAUTIFUL FLOWERING PLANTS IN MY POTS START TO DIE WITHIN A FEW DAYS. ARE THE PRODUCTS (SPRAYS) O.K. TO APPLY DIRECTLY TO THE PLANTS IN MY POTS OR JUST ON THE CONCRETE AND GROUND AROUND THEM??????? I FEEL AFTER READING ABOVE IT IS DUE TO THEM FEEDING OFF OF A HUGE ANT POPULATION. WE HAVE HAD THEM BAD FOR THE LAST TWO YEARS AS WELL. I AM DEFINITELY GOING TO PURCHASE SOME OF THE PRODUCTS LISTED ABOVE AND PRAY THEY REALLY WORK AND WELL!!!! This problem can definitely be solved. Get the Bifen listed above. Add 1/2 oz of the Bifen per gallon of water and using nothing more than any plant watering can, pour the mixed solution into all your plant pots like you would when you water them. The mixture will serve as water for the day (use this solution as water for the day) but the added Bifen will kill any ants or other insects the lizards are eating. Within 1-2 days of this treatment, the lizards will start to realize their local food supply is no longer present and most will be forced to move away. Now if you have insects living adjacent to the plant pots, treat these areas with the Bifen too. Cypermethrin is the stronger of the two sprays and normally what I’d recommend to kill off local insects but it can be a bit too strong for use in plant pots. But what is gentle and safe is the Bifen so go with this option for the plant pots and local area to control the ants and any other insects in the area. Lastly, after the Bifen is applied to the potted plants and local area around the plants, let the treatments be for 3-4 days to take full effect. After that time you can start applying the Pest Rid to make sure the lizards and insects stay away for good. Apply Pest Rid Granules and Pest Rid Spray every 1-2 months this should keep the problem in check and prevent it from happening again. Here are links to the Pest Rid in our cart. Please show your support for our business by purchasing the items we recommend from the links provided. Remember, this is the only way we can stay around and keep this valuable web site up and running. Thanks for your business! What if you have lizards coming in through the fireplace? Can you spray or place products there if eventually you will use the fireplace? Will it cause fumes that will harm if burned off? Can there be a nest, because I have seen more than one at a time in the home near the fireplace? What do you suggest for this problem? Lizards will routinely forage around gutters on most any roof which means they can eventually get close to fireplace flues and chimneys. And once they locate a fireplace where they can get inside, they will many times find the location ideal for roosting. It’s out of the weather, warm and dark – exactly the kind of location they need. From there it’s just a matter of time before they start coming down the exhaust pipe and making themselves visible in living spaces. Fortunately these situations are usually easy to treat. In fact none of our pesticide products pose any kind of hazard when applied properly in these areas where flames may be present some time in the future. This is true for a few reasons. First, the fire fumes are way more toxic and caustic compared to any mixed solution that might be sprayed in these areas. In fact, this is why fire smoke is always routed out of homes. And once flowing out of the home, it means all the fumes would funnel out with the fireplace exhaust, smoke etc. as well so that people inside will never be exposed to anything toxic. And even if by chance the chimney didn’t work right, the smoke would be thousands of times more toxic causing a quick death and essentially making any fumes from something sprayed in there a mute point. Long story short; nothing sprayed or applied in this area will be a problem whether you decide to burn a fire in there some time in the future or not. Now since any properly functioning chimney will be routing exhaust up and out of the chimney, it means any of the repellents applied below will have their scent funnel up the flue as well. This is a good thing because the net impact of the fumes will be to repel lizards in the area. So for starters, the best way to start treating would be to apply Pest Rid Granules in Granule Gards in the middle of the fireplace followed up by spraying Pest Rid Spray over the surfaces where they’ve been seen active inside the fireplace. Lastly, keep the flue open so the scent funnels up and out of the chimney which in turn will chase them away even further. Expect to see a good month of protection per application and after you can go 2-3 weeks without seeing any lizards, going outside and start treating the roof area around the chimney to help clear them away even more. This will make it less likely of any getting inside again. I want to just say that the Glue Traps works GREAT… for catching lizards that get into the house. Wonderful product and I highly recommend it and Bugspray.com too! Thanks for the feedback! No doubt the traps are easy to use and highly effective for a wide range of common household pests including lizards. If you review the article above, you’ll see the products needed to solve your problem. And if you click the links we’ve provided, you’ll see the products in our shopping cart where you can learn more about them, what they cost, how to use them, etc. Based on the limited amount of information you provided, I’d say you’ll need to get the Lizard Traps for inside the home. Install as many as possible to trap out what’s active inside. Within a week or two, they’ll trap out whatever you have active in the home. Next you’ll need to apply Pest Rid Granules around the outside of the home followed by Pest Rid Spray. This will help keep them off and away from the home which in turn will keep them out of the house. I noticed lizards around my front and patio door areas. Especially at night. What can I use to get rid of them so they won’t come in the house when you open doors to go outside or inside the house? If you review the article above, you’ll find your answer. For now, start with the Pest Rid Granules and Pest Rid Spray. Basically apply the granules along all the areas where you see them active. Next, spray over the top of the granules with the Pest Rid Spray and then also spray the side of the home adjacent to where you apply the granules. This will both repel them from the area and keep them away for a month or more per treatment. We recently moved into an apartment and after about a month realized that there are little clear lizards which come out every night when the porch light comes on. I absolutely hate lizards. We live upstairs so when I have to come home after dark I have the hardest time coming upstairs to get in the house because the lizards are on the ceiling and sides of the walls. It doesn’t seem like the Pest Rid Granules will work since we don’t have a yard but I am purchasing the Cypermethrin and Pest Rid Spray and hoping they will work. I found one in the apartment last night that came in from the patio when I opened the door to let the dog go out there about a week ago. Unfortunately my husband wasn’t home so I was forced to kill it myself. Fortunately it was a baby so it was little but I don’t like them no matter how big or small they are. I will come back and post how the products work once we’ve been using them for a couple of weeks. I am hoping that when it gets cold they will go away. It sounds like given where you are seeing the lizards, you purchased the right products. Just make sure to spray all the areas where you’re seeing them. Also, don’t stop there. Treat the surrounding areas around the porch too – especially close to the ground – since they could be coming from some plants in the area. Lastly, don’t forget the patio, around the door coming off the patio, etc. These are all key areas. Keeping them away from any route of entry into your living space will make it less likely you find any inside. Lastly, if you keep finding some inside, our Lizard Traps can really help. They work great, last several months and are easy to deploy. You’d want to place these around any route of entry like doors, windows, etc. where you know they’re living or nesting outside the apartment. We just moved into our new home in Orange County and we’re very excited to use our backyard. However, we noticed there are so many black lizards outside. We have a Koi pond and a small pool. We also have hydrangeas that look like they’re dying and I have seen couple of lizards around them. Please let me know what treatments I need to use to get rid of these lizards? Thanks. If you review our article above, you’ll notice there are traps, sprays and repellents. In most cases, the repellents will do the job. And if the lizards are only outside, this is what you should use to start. So for now, get some Pest Rid Granules and Pest Rid Spray. First, apply the Pest Rid Granules over any ground where you see these lizards moving, hiding or foraging. Next, spray over these same areas with the Pest Rid Spray. Pest Rid is a strong repeller that works on reptiles like lizards and snakes and will chase them away from any treated area within a day or two. But this means you may need to treat more than just the areas where they’re active to insure they don’t move from one part of the yard to another. For example, you don’t want them moving onto your home. So if any of these areas are close to the house, spraying the siding on your home would be smart. You don’t have to spray the whole side of the house but a band of spray around 1-2 feet wide just up off the ground may be required if they’re active close to the home. Lastly, Pest Rid is all natural and won’t pose any kind of hazard to people, wildlife or aquatic life so your Koi will be safe with Pest Rid around as will any family members. We have a colony of lizards that are digging out the sand under the pavers that support our hot tub. What would be the best way to have them leave? The Pest Rid repellent listed above will probably do the job. First, apply the granules to the areas you want to protect. One pound will cover up to 250 sq/ft. Next, spray the liquid Pest Rid over the granules. This will get them to stop and treatments should last 1-2 months. For a more permanent solution, install one of our Ground Stake Repellers. We’re getting good results using these in the yard to stop invading snakes, lizards and frogs.